Ready to enter the laser world? Have an “unused” laser in the closet? Give your practice a boost by harnessing laser technology with a positive result that manages effectively day-to-day periodontal to soft tissue patient conditions. Dr. Low shows you how to choose the right laser and apply simple techniques that result in precision, controlled bleeding, accelerated healing, reduced post-operative issues, shorter procedure time and a more relaxed experience for the patient. He presents procedures including non-surgical periodontics (laser bacterial reduction, curettage) frenectomy, gingivectomy, restorative troughing, biopsy, fibroma removal, implant uncovering and TMD bio-stimulation with consideration of coding and patient acceptance. Experience direct hands-on activity with diode lasers on a variety of models including a pig jaw. Dr. Low works with you, providing insight into each procedure in a step-by-step fashion to instill confidence when you return to the practice. A Waterlase also will be available for hands-on activities. 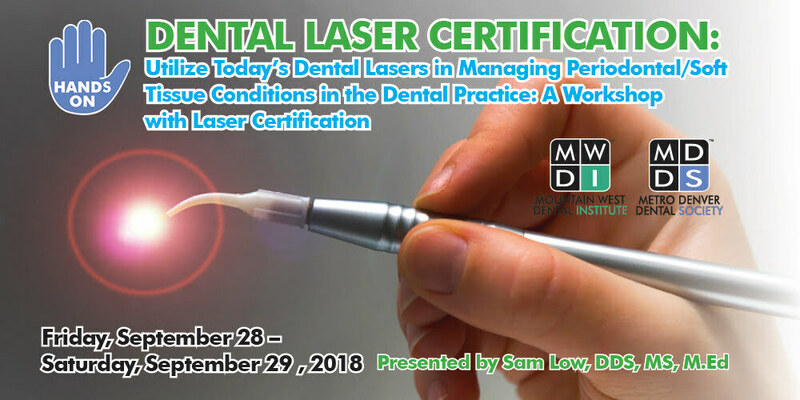 The course is designed for both dental hygienists and dentists and complies with standards for laser certification which will be awarded with successful examination completion. Consider case reports demonstrating success along with clear contraindications. Samuel Low, DDS, MS, MEd, has 30 years of private practice experience in periodontics, lasers and implant placement. He is professor emeritus at the University of Florida, College of Dentistry and an associate faculty member of the Pankey Institute. He is also a diplomate of the American Board of Periodontology and past president of the American Academy of Periodontology. He sits on the board of directors of the Academy of Laser Dentistry. Dr. Low receives financial/material support from Florida Probe Corporation, serves as a consultant for Hu-Friedy and Philips Sonicare and is an employee of Biolase. Continental breakfast provided on both days and lunch on Friday.